Sometimes it’s the simple things in life that give the most pleasure. This featured pool is no exception. With beautifully clean lines set within a perfectly manicured lawn, this 10m x 4m pool doesn’t need any additional features to standout. The homeowners came to Personal Pools with a vision of a pool that fit perfectly within their surrounds and provided plenty of space to sit and relax. Personal Pools’ in-house designer, Matthew Scrase, worked closely with the client and landscape team to make that vision a superb reality. The pool is centrally located within the outdoor space and provides great views of the house and abutting golf course. Natural quality grass was grown around the pool area and pencil pines were planted to create a striking minimalist look. Taking things back to basics has never looked better. Specifically planned with plenty of open space surrounding the pool, this area is perfectly designed to accommodate an entertaining setting for alfresco parties, as well as doubling as an ideal family setting, allowing plenty of room to spread out and play games with the kids in between frequent dips in the pool. Utilising Austral solar heating and thermal pool covers, Personal Pools was able to integrate the latest in natural heating technology into the final design. This, coupled with a Hayward quality cartridge filter, displayed the most up to- date modern technologies that have been built to last. Spa Electrics LED lights were incorporated into the design, allowing the pool to be used day or night, with the pool’s light blue tiling providing a stunning display when illuminated. Bronze natural up lighting was specifically chosen to show off the surrounding landscaping, with both lighting features combining to create a visual masterpiece. Personal Pools specialises in reinforced concrete pools. The company operates predominantly out of the Peninsula and south eastern areas, building approximately 40 pools each year. Chris Howley, the creator of Personal Pools, has been in the industry for 28 years. Combining professionalism with local knowledge to create a first-class company, Chris’s vision has extended to include a total in-house design and landscape team. With so many professionals in one company, Personal Pools is capable of providing the complete landscape and pool package for their clients. Personal Pools have won numerous awards and accolades, most recently winning Best Pool Under $100,000 and Best Courtyard Pool, as well as silver for Best Water Feature at the 2009 SPASA Awards. 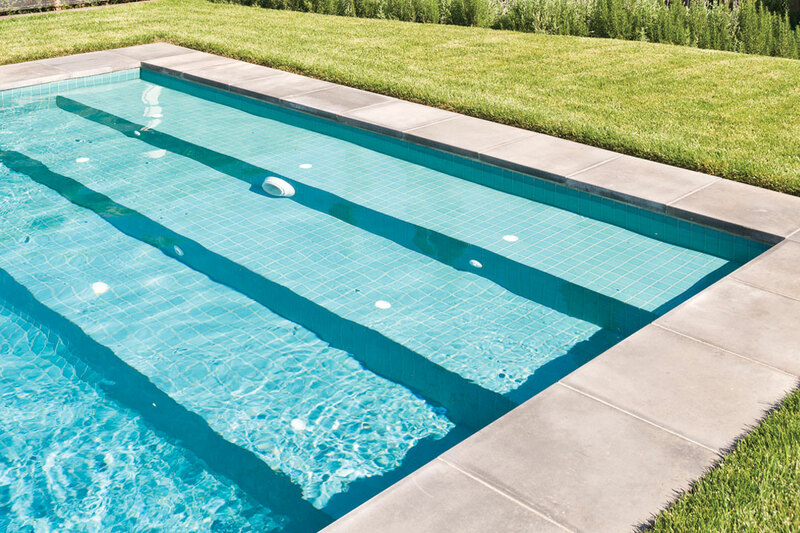 When you choose Personal Pools, you know you’re in the hands of professionals.